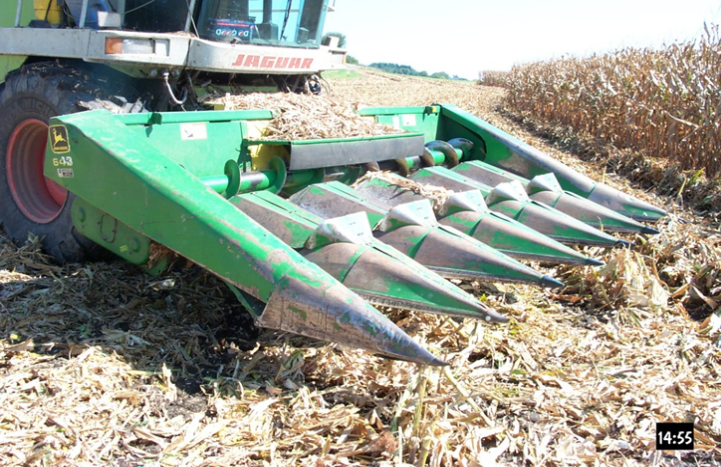 Harvesting corn snaplage is a viable alternative to rolled high moisture shelled corn (RHMC). Snaplage generally contains the ear (cob and grain), husk, and shank and is harvested using a self-propelled forage harvester equipped with a snapper head and an on-board kernel processor (Picture 1 & 2). This allows for earlier corn harvest which proceeds more rapidly with kernel processing done in the harvester rather than at the silo as done with RHMC. 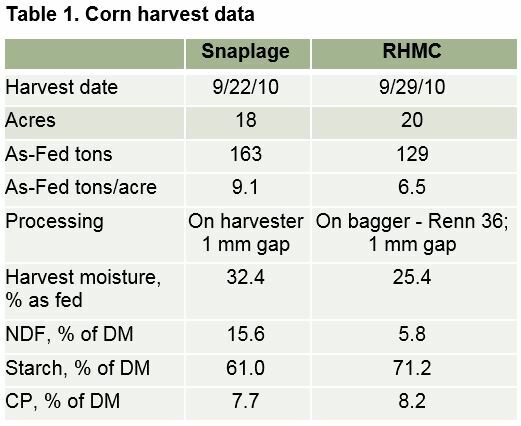 However, snaplage has different nutritional qualities and harvest management considerations than RHMC. Considerations include moisture content, forage harvester set-up, storage capacity, and potential impacts of starch digestibility on milk production. This article will focus on important management practices and provide results of recent research at UW-Madison with feeding snaplage to dairy cattle. Proper moisture content is needed for high nutrient content and adequate packing. Recommended snaplage moisture is between 32-40%. Kernel moisture of 28-35% is recommended with harvest beginning at black-layer (34-35% kernel moisture) to maximize starch accumulation (Mahanna, 2008). Snaplage is typically 5% higher in moisture than the kernels due to the cob having greater moisture. Harvest at 28-35% kernel moisture will result in snaplage having 33-40% moisture. 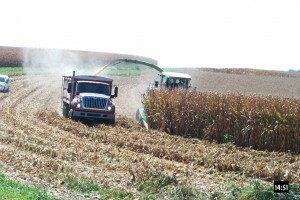 Harvesting at more than 40% moisture (less mature kernels) will reduce starch content. Data from Minnesota plots had 59 to 63% starch when moisture was 33 to 40% and 55 to 56% starch when moisture was 44 to 47% (Mahanna, 2008). Harvesting too dry (<32% moisture) will result in lower fiber digestibility, poor packing/fermentation, and sorting. Timely checking of kernel maturity and moisture is necessary to determine snaplage harvest timing. It is generally recommended to error on the wetter side of the range (35-40% moisture). Proper set-up of the forage harvester is also needed. Theoretical length of cut (TLOC) should be as small as possible by using all cutter knives and reducing feed roll speed. Other modifications may include a recutter floor with stationary knives perpendicular to the knife drum to tear the husks or a recutter screen between the knife drum and processor that retains larger particles until small enough to enter the processor. The kernel processor should be at 1 mm roll spacing with a higher speed differential of 40% to ensure kernel damage. Recent work at UW-Madison harvested snaplage at 0.35” TLOC and 1 mm processor gap and resulted in similar particle size of the grain portion compared to RHMC and an estimated total tract starch digestibility of 97% (Akins and Shaver, 2014). Snaplage storage will require additional capacity than RHMC due to greater yield and lower density. Typical densities of snaplage are 30 to 40 lb DM/ft3. Adequate feed-out is needed to maintain quality with a minimum of 12 inches removed per day recommended. Use of narrow bunkers or bags may be needed to feed adequate amounts depending on your diet inclusion rate. It is suggested to work with your nutritionist to estimate diet inclusion and then the silo size for adequate feed-out. Use of an inoculant with Lactobacillus buchneri can also reduce heating and help maintain feed-out quality. Snaplage typically has 10% more NDF and 10% less starch than RHMC. The additional fiber has good digestibility (55 to 70%) if snaplage is harvested in the proper moisture range (Soderlund et al., 2006). Snaplage energy content is usually 10% lower than RHMC due to more fibrous material. If too dry, digestibility of the cob will decrease and further lower the energy content of the snaplage. A trial was conducted at the UW-Madison Blaine Dairy Research Center to compare dairy cow performance when fed snaplage or RHMC (Akins and Shaver, 2014). 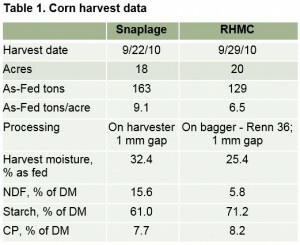 Snaplage and RHMC were harvested from the same field with the same hybrid on two dates to get desired moisture levels. Harvest information is in Table 1. Target moisture levels were 28-30% for RHMC and 32-35% for snaplage. Moisture levels at feed-out were 21.8% for RHMC and 31.5% for snaplage. Both were drier due to fast dry down and a brief delay of the custom operator for snaplage harvest. Both were stored in 10 ft diameter silo bags until feeding started April 28, 2011. Sixty Holstein cows at approximately 100 DIM were used. Cows were fed one of three diets with either 1) RHMC at 21.5% of DM, 2) snaplage at 29% of diet DM (SNAP), or 3) snaplage at 20% of diet DM plus dry ground shelled corn at 9% of diet DM (SPDC). All diets included corn silage at 22% of DM and alfalfa silage at 33% of DM. The RHMC diet included soyhulls at 9% of DM to have similar NDF content to SNAP and SPDC. Cows were fed diets in 30 electronic gate feeders to measure individual intakes. Cows were fed a 50:50 mix of RHMC and SNAP for a 2-week adjustment period followed by an 8-week treatment period when cows were fed their treatment diets. Dry matter intake was higher for cows fed RHMC (59.6 lb DM) than both SNAP (54.8 lb DM) and SPDC (53.3 lb DM) due to greater starch digestibility of the snaplage. Milk yields were similar averaging 86.7 lb/day. Component-corrected milk yields were also similar resulting in higher feed efficiency (lb milk/lb DMI) for both SNAP (1.57) and SPDC (1.62) than RHMC (1.46). Milk fat % was reduced by 0.27%-units for SNAP compared with RHMC likely due to greater starch digestibility for SNAP (Figure 1). Partial replacement of snaplage with DGCS alleviated the depression in milk fat % with SPDC being 0.12%-units higher than SNAP, but still 0.15%-units lower than RHMC. The snaplage containing diets (SNAP and SPDC) had starch levels of 26-27% of DM while RHMC had 24% of DM which also could lower milkfat levels. Higher starch in SNAP and SPDC was due to snaplage having 61% starch while diets were balanced using a starch level of 52%. Milk fat yield, milk protein % and protein yield were not affected by treatments. These results indicated that well-fermented snaplage may have a high starch digestibility and diets may need a source of starch with lower digestibility such as dry corn to maintain milkfat levels. Nutrient analysis at feed-out is important as this will vary depending on the kernel maturity, moisture level, and forage harvester settings. Also, starch digestibility can change the longer snaplage is stored. Figure 2 shows that ammonia-N; an indicator of starch-protein matrix breakdown, continued to increase over time in the snaplage but did not in the RHMC. This increase would have likely occurred with RHMC harvested at recommend moisture levels (25-30%). In the tool it is recommended to use corn silage, shelled corn, poor quality hay, soyhulls, and soybean meal for comparative nutrient values. For the nutrients, to calculate the price it is recommended to use NDF, starch, and CP content as these nutrients are easily obtained from lab analysis and are most likely to be variable between snaplage lots. 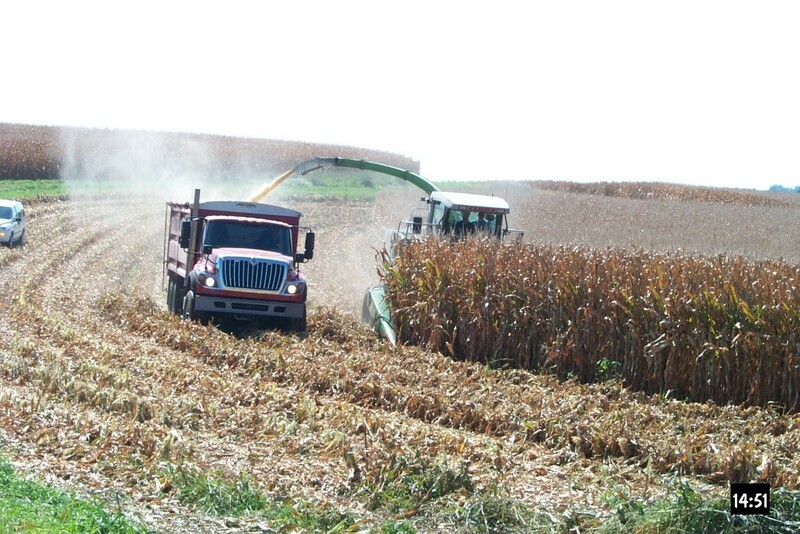 Harvest of corn as snaplage can be advantageous by having an earlier and faster rate of corn grain harvest and allow for more fall field work. In addition, milk production was similar for cows fed snaplage or RHMC. Caution should be used when feeding snaplage due to high starch digestibility which may lower butterfat levels. Having the ability to add dry corn can alleviate this risk. Producers must properly manage snaplage harvest to ensure a consistent product at the correct moisture with minimal stalk or trash is going into storage. It is recommended to send samples for nutrient analysis at feed-out to account for possible variation and needed diet changes. Akins, M.S. and R.D. Shaver. 2014. Effect of corn snaplage on lactation performance by dairy cows. Professional Animal Scientist. 30: 86-92. Mahanna, B. 2008. Bottom line: Renewed interest in snaplage displayed. Feedstuffs. 80(50), Dec. 8, 2008. The Miller Publ. Co., Bloomington, MN.